i’m assuming that this also applies to hunger? Hunger … it’s like a thousand tiny ninjas attacking your stomach. I need this on a coffee mug! It’ll make a great Mother’s Day gift! Doug must be in luuuuv. Wow. My future boyfriend is going to LOVE this! This is one of your best. Keep it up! I think the coffee mug is a great idea. Love is good. Makes for a happy person. Give as much out as you can. Wow! Nice drawing Doug. Way to kick it up a notch. sorry… i’ve really been getting into these cartoons recently but this one has baffled me. surely if a thousand tiny ninjas were to attack the brain this would prove to be almost certainly fatal and potentially very messy. maybe the ninjas are REALLY tiny and don’t inflict much damage? msybe i experience love in a totally different way? and you will never see them coming. This is so great! And now imagine this phrase in a Barry White song…. 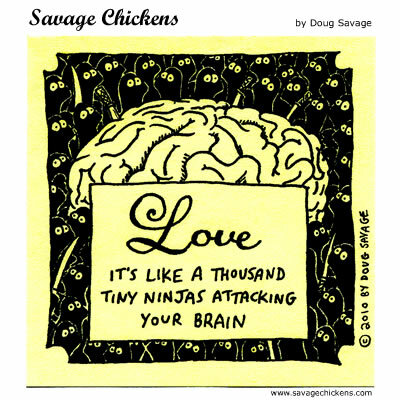 Thinking is like a thousand tiny ninjas attacking your love. this NEEDS to be on a mug or my brain will EXPLODE…crap maybe thats the ninjas attacking it…either way put this on a mug!!! haha, that makes more sense now. 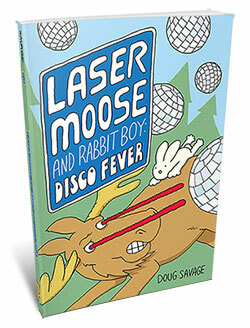 Also, perhaps both are a little scary, but TOTALLY AWESOME? !